s you mull over various holiday baking ideas, consider making homemade granola. It’s tasty, easy to pull together and this particular recipe is filled with so many fantastic ingredients… you may start drooling before you even make it. 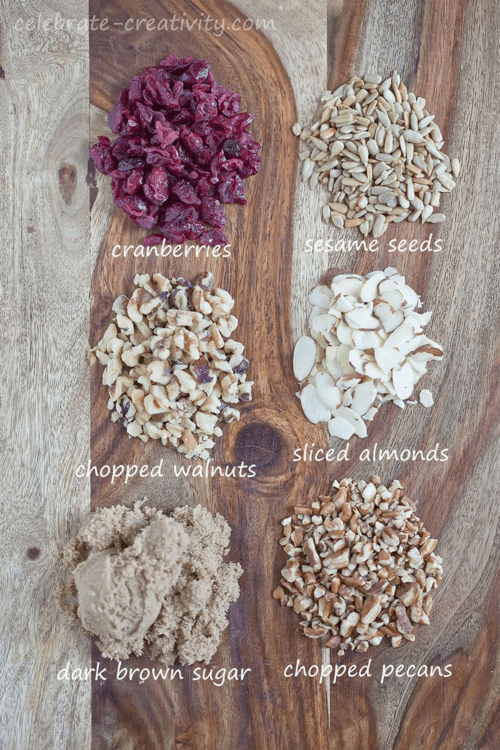 Welcome to Day 6 of my 25 Days of Christmas holiday series which all about GRANOLA. Granola is actually pretty simple to make and when packaged up nicely in mason jars and adorned with seasonal embellishments, it can make for a wonderfully delicious holiday gift. I’ll bet you have more than a few people on your gift giving list who would love a jar of this. This recipe calls for the most delicious ingredients ever. Take a look at the goodies below. 2-cups rolled oats, 1/3-cup wheat germ, 1/4-cup slivered almonds, 1/4-cup chopped pecans, 1/4-cup chopped walnuts, 1/4-cup unsalted sunflower seeds, 1/3-teaspoon salt, 1/4-dark brown sugar, 1/4-cup maple syrup, 1/4-cup honey, 1/4-cup grape seed oil, 1/4-teaspoon ground cinnamon, 1/2-tablespoon vanilla extract, 1/2-cup dried cranberries (or raisons or other dried fruit). Mix all the above-named ingredients together thoroughly. Spread mixture evenly on parchment paper-lined baking tray. Bake for 20 minutes, then turn mixture over so all ingredients are equally baked then bake for another 20-30 minutes. Remove from oven and set aside and allow to cool. Once cooled, you may notice many of the pieces will be stuck together. Simply break them apart. Fill mason jars with the finished granola. Homemade granola makes a wonderful gift any time of the year but holiday packaging is especially pretty. I used burlap circles, wrapped around the mason jar lids. Simply add some artificial holly berries and a pine needle sprig… tie it all together in place with some jute and VOILA. TIP: After you cut the burlap circles to cover the jar, hold the burlap in place with a thin rubberband. That way you can adjust the burlap drapping so it’s perfect before tying the jute around the jar. After the string is firmly tied, just clip or slide the rubberband off the jar. 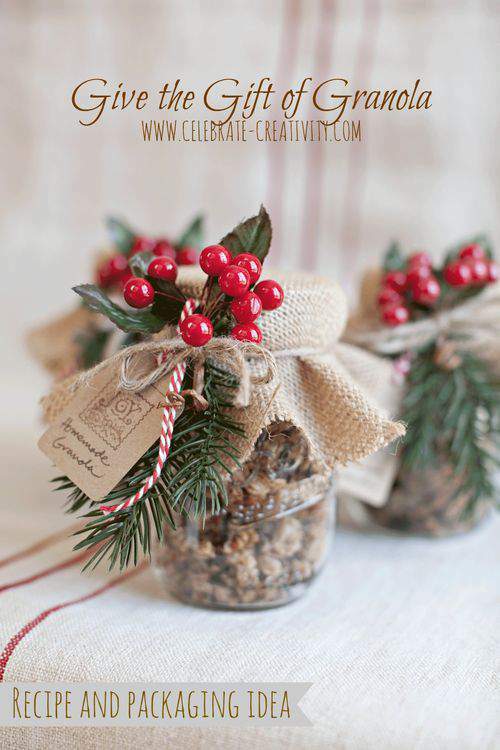 You’ll then be left with gorgeous and festive granola-filled jars to gift to friends and loved ones. Add another touch of charm with simple, handcrafted tags using craft-colored paper stock, a rubber stamped image and a little baker’s twine to tie tag to the jar. You can use your own handwriting to identify the contents. When you decorate the mason jars like this, I think it makes for a beautifully festive presentation. If you have holiday parties to attend in the next few weeks, these would also make nice hostess gifts. NOTE: This recipe should make enough to fill 4-regular size Mason jars. Day 6 down, 19 more days to go. I hope you’re enjoying the series so far. Stay tuned, there’s a lot more fun and inspiration in the days ahead. Hope you stop by again tomorrow (12/7) for Day 7 of my 25 Days of Christmas holiday series. Thanks for sharing! This looks like a great gift idea. May I ask how many servings this makes? Hoping to make this for 7 people. Thanks! I’ll have to go back and add the quantity in the post. As I recall, I believe this batch was enough to fully fill 4 regular size Mason jars. You’ll need to make at least to batches to serve that many. It’s delicious and makes such a beautiful gift. You do inspire one to be creative. I love the granola and how pretty you made the presentation! Thanks for all you do to keep our creative juices moving. Lisa, I have been following your blog for a few years now and always so pleasantly surprised at your creativity and the beautiful way you share. Thank you! cool idea – might make some for my bosses!